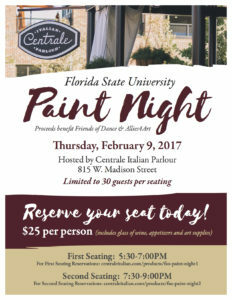 Please join Centrale Italian Parlour and the College of Fine Arts for Paint Night. The event will take place on Thursday February 9, 2017 at Centrale Italian Parlour. It is $25 per person and your reservation includes a glass of wine, appetizers, and art supplies. There are two time slots and they are limited to 30 guests per seating, so reserve your seat today! Check out the Facebook event page and let us know that you’re coming!